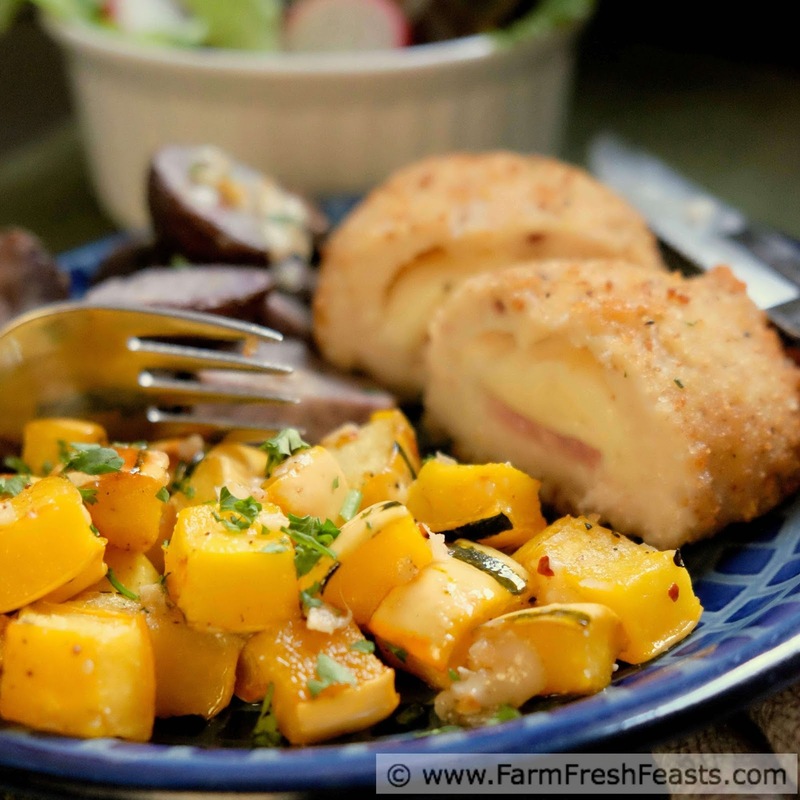 Cubes of tender delicata squash roasted with fresh garlic and spices then topped with Parmesan cheese makes an easy and colorful side dish to celebrate Fall. This post is sponsored by Barber Foods. I bought my ingredients and Barber Foods paid me for my time to create this recipe. 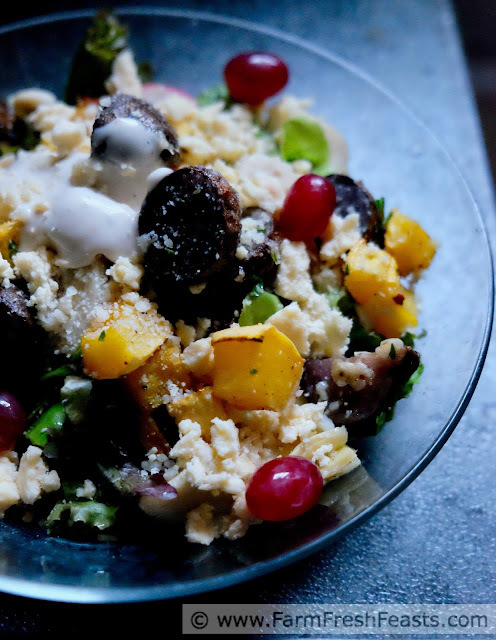 I'm glad to feel a chill in the mornings now that Fall is here--it makes me happy to turn on the oven so I can convert the Community Supported Agriculture (CSA) farm share produce into new and delightful dishes for my family [and new ideas for you!]. For us folks who eat seasonally, the change of season provides a change in the contents of the farm share box--a return of greens plus the arrival of winter squashes in all their glory. The farmer's markets and grocery stores are brimming with gorgeous piles of squash, too. Winter squash is one of the best parts of joining a CSA farm share. Because these squash can be stored in a cool dry place for months, you can be eating locally grown produce well into the winter. I've even cracked open a butternut squash in April! This is one way I feed my family local produce all year long. I turn a basket-lined bookcase in the basement into the Strategic Winter Squash Reserve, and each week I add all the squash and potatoes from the farm share. I walk past the SWSR while I'm doing laundry, so it's easy to keep an eye on things. I feel fortunate I'm getting lots of delicata squash this year. 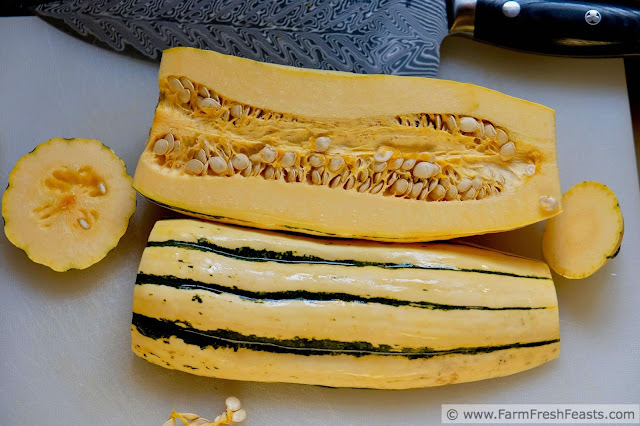 Unlike the other winter squash varieties, the skin on a delicata is edible. That means I get those pretty green and orange stripes on my plate! The first way I ever prepared delicata squash was Alanna's Delicata Squash with Hot Pepper Glaze, and it was a nice spicy change on my Thanksgiving table. Lately I'd been eyeing my delicata hoard and thinking that this roasted dish, with cheese and a bit of a kick, would be a good side dish this Fall. I seem to concentrate on the sides, since I'm always trying to use up all my fresh local produce, and the entrees become an afterthought. When I was invited to participate in the Make It A #BarberNight campaign I was already familiar with the stuffed chicken breast product. Twenty years ago, in a previous life, I was deployed to Croatia. We were a small hospital staff, living in hotels and eating "on the economy". That meant that during my 24 hour shifts I needed to eat whatever I brought in or purchased on our compound. The post shopette (aka military convenience store) stocked Barber Foods stuffed chicken breast with broccoli and cheese. We had a tabletop convection oven in the hospital lounge, and over my 120+ day deployment I baked many a broccoli & cheese stuffed chicken breast for dinner. It was an easy meal during a busy time. Now I tend to focus my energies on using the farm share produce. With a spouse who is mostly a vegetarian (unless he knows how the meat was raised), the protein becomes secondary to the meal. That doesn't thrill the carnivorous kids, so I went big and purchased the Chicken Cordon Bleu version. They were pretty excited to have a fancy stuffed chicken breast, oozing with gooey cheese, alongside the roasted vegetables. I was pleased to create such a nice, well-rounded meal after work! It's especially easy when I'm only using the oven to complete a meal--one kitchen appliance is about all I can handle some days. After I got the squash and potatoes in the preheated oven and roasting, I simply slid the chicken out of the packaging and set it on my cookie sheet. [I like to use parchment paper for easy clean up, though those crock pot baggies give me the willies.] I turned down the oven to 375 and baked both the chicken and the vegetables at the same time, for about 35 minutes. While the chicken was cooling, I tossed the vegetables with crushed red pepper and parsley. Then we were ready to serve. That's just too easy. 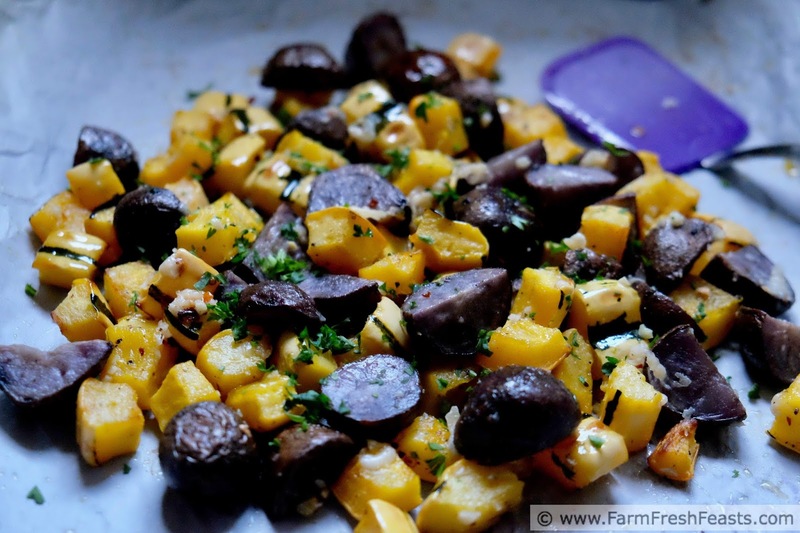 I roasted some purple potatoes alongside the delicata squash because I wanted lots of color. Same technique. I even had time to make a main dish salad for my spouse, topping the farm share greens and radishes with the roasted vegetables, then adding even more Parmesan and Wensleydale cheese, olives, marinated artichoke hearts and red grapes. The whole family was satisfied. 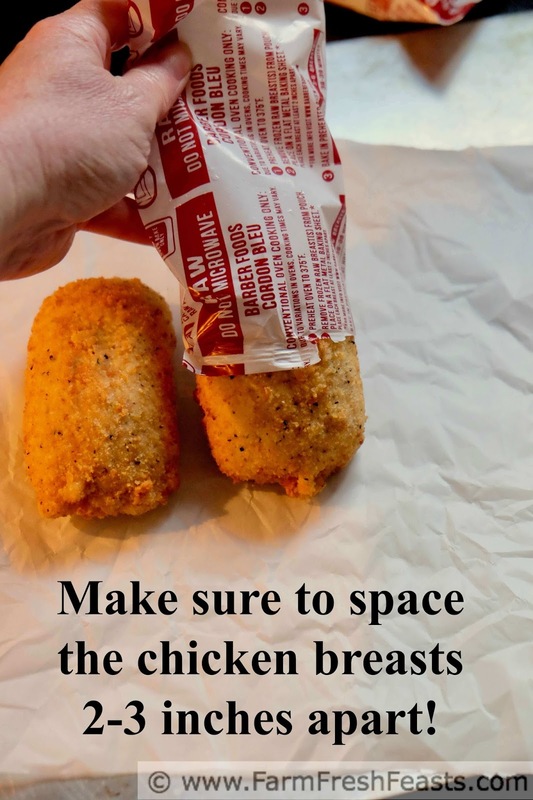 I bought my Barber Foods stuffed chicken breast at my local Kroger, in the frozen meats aisle. 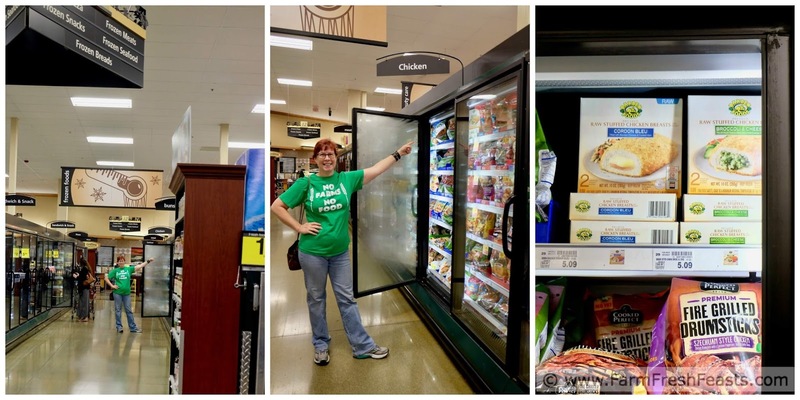 Yes, I am a big nerd and made my spouse take my picture--but you can use this handy product locator to find some near you! For more recipes using delicata squash, please see my Winter Squash Recipes Collection since I don't have enough delicata posted--yet--to warrant an entire Collection. However, I'm working on more! This collection is part of the Visual Recipe Index by Ingredient, a resource for folks like me eating from the farm share, the farmer's market, the garden, the neighbor's garden, and great deals on ugly produce at the grocery store. Preheat oven to 400 degrees Fahrenheit. For easy removal/clean up, line a rimmed baking sheet with parchment paper. 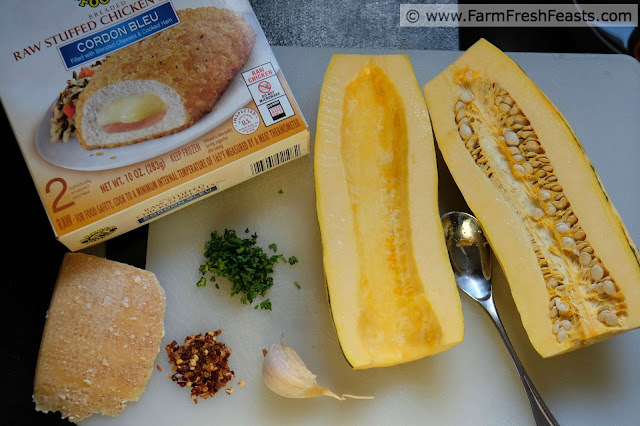 Slice the ends off the squash, then slice in half lengthwise as shown above. Scoop out the seeds (compost 'em if you got 'em) and slice into long sticks and then bite-sized cubes. Leave the skin on! 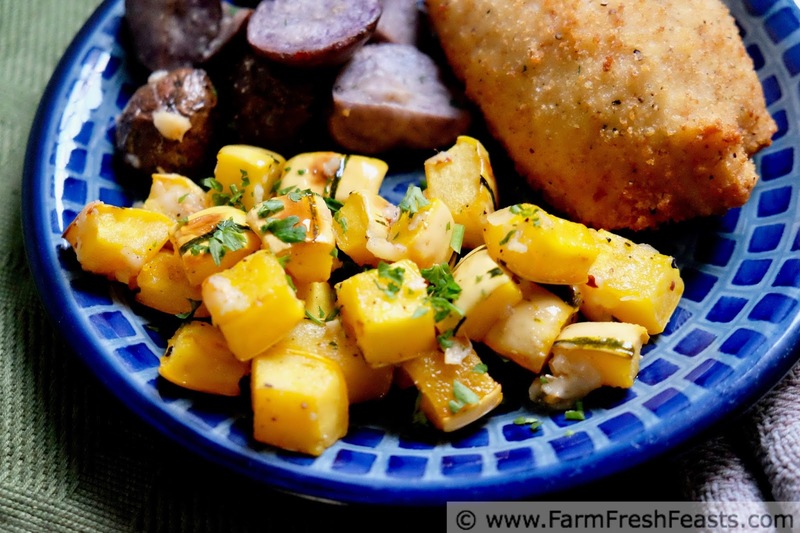 In a large bowl, toss the cubes of squash with olive oil, then sprinkle salt and pepper on top and toss again. Spread onto prepared pan. Bake for 20 minutes, stir, add garlic, and bake for about 20 more minutes or until tender. Scatter Parmesan cheese on top and return to oven for 3-5 minutes until cheese melts a wee bit. Remove from oven, scatter red pepper and parsley over top, and stir. Serve warm. The squash looks delicious! Garlic and Parmesan are two of my favorite things! Are you a redhead now? Looking sassy and snazzy. Also what are these Crockpot bags you speak of? As someone who just cleaned out her crockpot last night, I'm fascinated and all about easy meals these days. Thanks for the recipe. I need to put that chicken on my shopping list for the days when I don't have the brain power to make something complicated like salad. Thank you very much. This article adds to my knowledge and very helpful! Thanks for this great article. 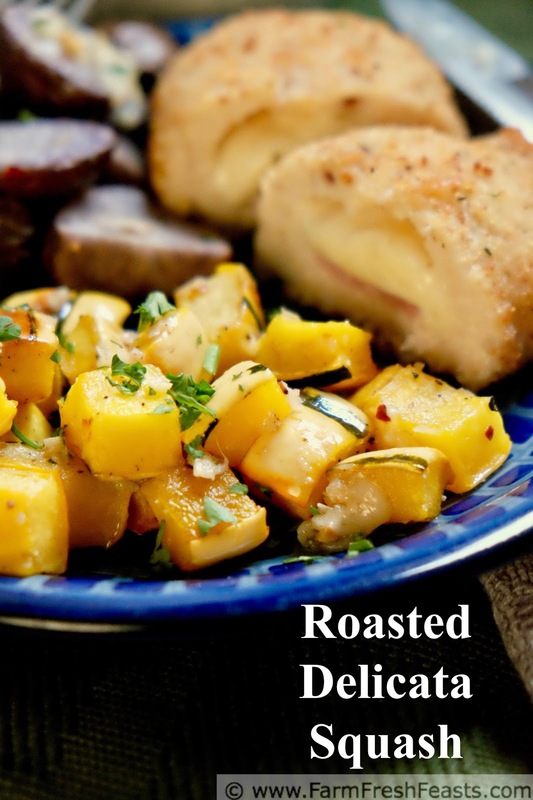 I have found a lot of great ideas about cooking this roasted delicated squash.This really looks so delicious and it is good to know how to cook some kinds of recipes like this.